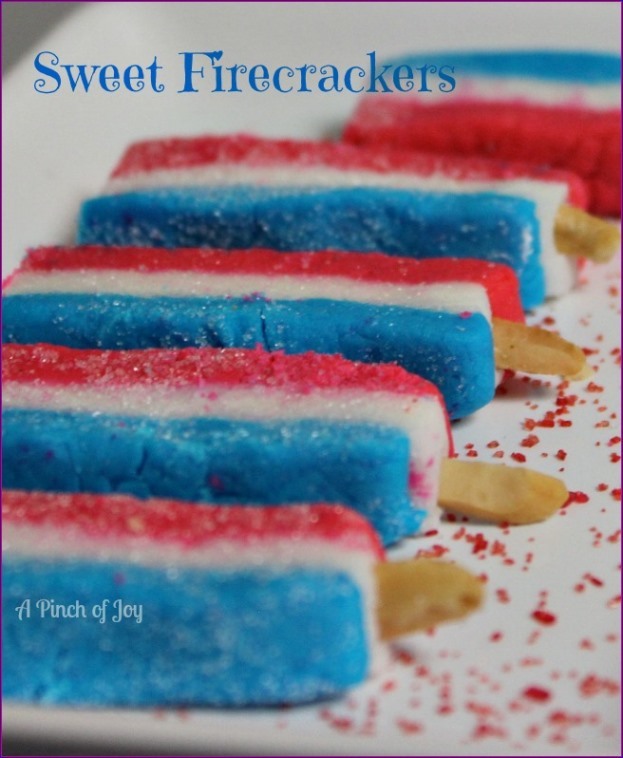 Sweet Firecracker mints — A surprising treat for Fourth of July! Sweet liberty, the shot heard around the world and firework celebration rolled into one. This is a cream cheese mint recipe updated with intense coloring and a surprising — yet subtle — flavoring that refreshes! Cinnamon gives these cute little treats their firecracker kick. Only three ingredients, quickly mixed and patted into shape, then left to dry overnight. Use them for a fun mid afternoon treat or a light finish to a meal before the firework show — or to package up for a take home favor. Cream cheese blends so much better when it is room temperature and soft. If you didn’t set it out ahead of time, you can remove the wrapper and zap it in the microwave at 50% power for 10-15 seconds until it becomes soft and pliable. Measure the powdered sugar then add the cream cheese to the middle. Measure the 1/4 teaspoon of cinnamon flavoring and add to the top of the cream cheese. Beat with electric mixer until the mixture is crumbly. Use your (clean, of course!) hands to pull the crumbs together into a ball. Taste to see if you have enough flavoring. I usually do add a bit more flavoring but the total still comes out less than half a teaspoon and it really does depend on the brand and your taster! If you need to add more, do so just a couple of drops at a time and knead the entire ball of candy well to distribute the flavoring. The flavor is better on the subtle side so it leaves your mouth feeling refreshed for a long time afterwards. You can go for the knock your socks off flavor while mixing but that leaves your mouth feeling burned instead of refreshed when you eat the candy later! Divide candy equally into thirds. Add blue food coloring to one third and red food coloring to another third. Gel food coloring (I used Wilton) gives the deepest color. Dip a toothpick into the gel and add the coloring to the candy with the toothpick. This gives you a bit of control over the amount added without leaving a lot of coloring in a measuring device so tiny you can’t scrape it out. Use a clean space to knead the candy for each color. One of those thin cutting mats that can be thrown in the dishwasher after use works great. Roll each segment of colored candy into logs of equal length. Sweet liberty, the shot heard around the world and firework celebration rolled into one. This is a cream cheese mint recipe updated with intense coloring and a surprising -- yet subtle -- flavoring that refreshes! Place powdered sugar in medium mixing bowl and add cream cheese and flavoring. Beat with mixer until mixture forms large crumbs and is well mixed. Use hands to knead crumbs into ball. Taste and adjust flavoring as needed at this point. Knead in any additional flavoring and divide ball of candy into thirds. Color one third red and one third blue, kneading each segment well to thoroughly distribute coloring. Working on a different sheet of waxed or parchment paper for each color, roll each third into a log of equal lengths and then flatten to equal width and height. Stack layers -- red, white and blue - then slice into one quarter inch pieces. Dip each cut side into granulate sugar and set aside to dry for several hours. 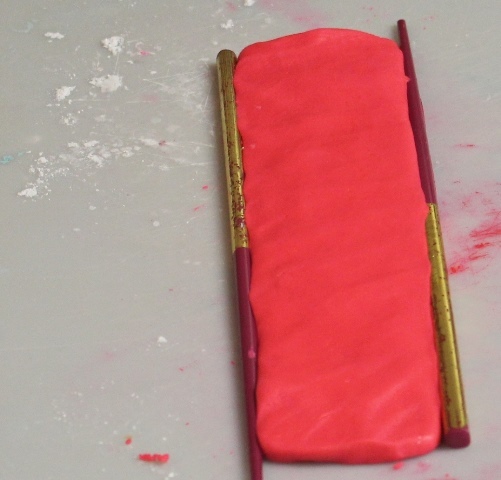 If desired, add a slivered almond to one end of each piece to make a "wick" for the firecracker.